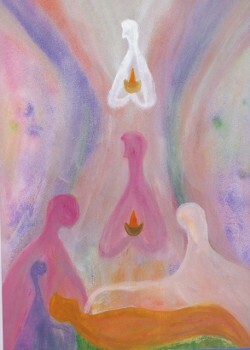 Painting by Mother Meera showing several Divine Beings. Mother Meera’s approach to health and wellbeing is manifestly practical. About diet, for instance, she says one should eat what is good for one’s body – whatever genuinely strengthens health. For example, some people actually need to eat meat to maintain their wellbeing, rather than trying to keep to a strictly vegetarian diet that may be considered to be more spiritual. In fact, she says, dietary preferences have little to do with spiritual progress. One should care responsibly for one’s body, with common sense. Many people approach Mother for healing and she always advises a visit to the doctor as the first option to solve any problem, saying that her Light will help and support the healing process.